Are Your 2nd Graders Ready for 3rd? As the school year winds down, you can have great evidence that your 2nd graders are ready for 3rd grade math. 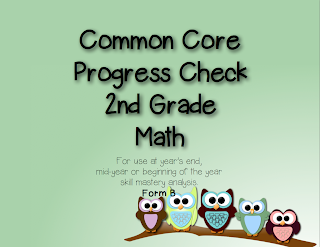 I gave "Common Core Progress Check 2nd Grade Math Form A" to my students a couple of weeks ago. Now I'm targeting students who still need work with particular standards. In the last few days, I'll give Form B (now available--see below) as a year-end math exam. 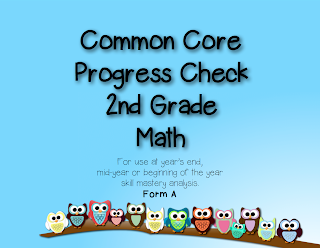 It will be great for parents to see--it clearly shows who is ready for 3rd grade math! Download Form A and Form B from my TpT Store, my Teacher's Notebook Site, OR click here to see how to get any single unit for FREE! 2nd Grade Common Core Language--Piece of Cake! Mastery tests and Quick Check Answer Sheets are included for easy grading and proof your kiddos have mastered the standards. 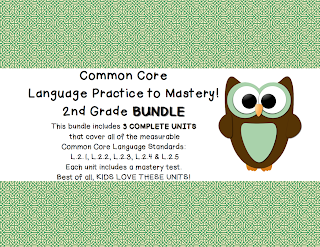 Download this great bundle today at my TpT Store, my Teacher's Notebook site, or CLICK HERE to learn how to get any single (unbundled) unit for FREE! 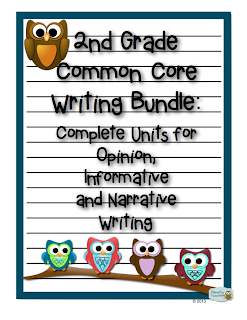 Kindergarten through 3rd grade Common Core Writing Bundles are now available! It's like getting the 3rd unit for $2! 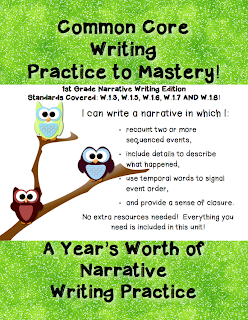 A year's worth of Common Core Writing instruction for $12--a steal! Also CLICK HERE to learn how to get any single (unbundled) unit for FREE! Attention, Kindergarten Teachers! 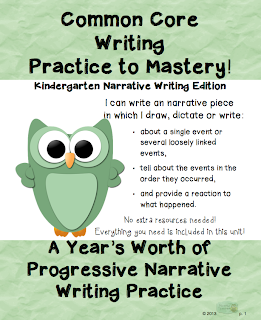 Here's everything you need to produce multiple narratives throughout the year and allow your kinders to progress from drawing to writing! Download this unit today at my TpT Store, my Teacher's Notebook Site or CLICK HERE to find out how to get any unit of your choice for FREE! It includes three reusable units that have you covered all year long in 2nd grade Common Core Writing! Download today at my TpT Store, my Teacher's Notebook Site or CLICK HERE to learn how to get any single (unbundled) unit for FREE! Common Core Kindergarten Informative Writing! Download today at my TpT Store, my Teacher's Notebook Site or CLICK HERE to find out how to get any unit of your choice for FREE! 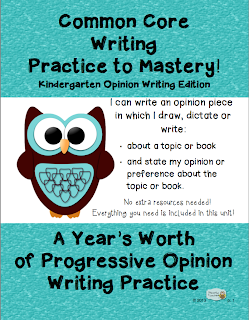 Kindergarten-level opinion writing made EASY! Begin with drawing, then to dictating, then independent writing as you use this unit again and again throughout the year! Download today from my TpT Store, my Teacher's Notebook Site or CLICK HERE to get any one of my units for FREE! 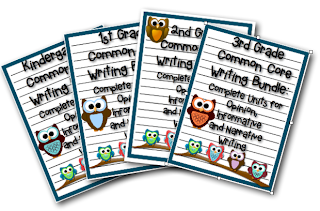 First Grade Common Core Narrative Writing made EASY! This first grade narrative unit completes the first grade set! As a National Writing Project Fellow, I know how important it is to make teaching writing easy and FUN for the teacher AND the students! I feel confident you'll love using my units. 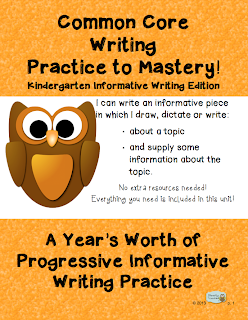 Even more important, your students will be PROUD of the writing they produce! It's a Win-Win! Download today from my TpT Store, my Teacher's Notebook Site or CLICK HERE to learn how to get any one of my units for FREE!